In this age of instant gratification, where people want to consume fresh content every day, digital platforms emerged as a channel that met their needs. A digital publishing platform allows all kinds of content such as books, magazines, videos, newspaper etc. to be made available on smartphones and tablets. So, it comes as no surprise that educational publishers are trying to leverage this platform to deliver learning to K-12 and university students. The concept of mobile learning, BYOD (bring your own device), MOOC, etc., were all developed due to digital publishing. Users have been hooked on to this model of content distribution and consumption because a digital publishing platform offers interactivity. And ever since this technology gathered momentum, there have been a number of interactive digital publishing platforms that have come up with enhanced features to cater to the growing needs of the learners. Let us see a few benefits of delivering learning through a digital publishing platform. An eBook platform can contain thousands of titles. Although it’s highly unlikely for students to have to refer to that many books in an academic year, it’s still available nonetheless. So, students can have every possible learning material in one eBook platform. This enables them to read the content anytime and anywhere, providing unlimited access to a variety of learning materials. Digital publishing has also given rise to digital libraries which lend audiobooks, eBooks, newsletters, project reports, thesis, video lectures, case studies etc., at a nominal fee. These digital repositories are a convenient and affordable online resource for students. Learners can download additional reference materials from these digital bookstores when needed to support their learning process. By replacing printed books with digital eBooks, learners now have anytime access to the learning material. With digital learning, students have an opportunity to interact with professors and external faculty on an online platform. Contrary to traditional learning methods where students have to attend lectures in a classroom to meet and interact with their faculties, digital publishing platform allows students and professors both to communicate with each other in spite of geographical differences. Teachers can review and evaluate online assessments and provide individual feedback to students. This is because a digital publishing platform takes into consideration all the latest technologies and applications used by millennials, and tries to provide a similar interface which the users are already familiar with such as social platforms, video conferencing, video calls, discussion forums etc. This facility provides students an opportunity to learn from highly qualified and experienced professionals and enhance their knowledge base. Content that is presented on a digital platform allows students to interact and engage with it. Learners can highlight text, search text and make notes on their learning devices. Other features include day and night changing the mode to allow reading in different light conditions, dictionary, font change. Apart from all these features, a digital publishing platform also contains multimedia elements like videos, audio explanations, animation etc. The combination of all these elements makes interactive courseware. Interaction with the learning material fosters engagement, which leads to better retention. Hence, a lot of digital publishing platforms today come with a default set of interactivities to keep the readers engaged. Digital publishing has enabled the creation of a courseware that allows holistic learning. By incorporating self-assessment techniques, publishers have ensured that students can review their performance for themselves. Assessments include drag and drop, sequencing, labeling, filling in the missing text, etc. These assessments, when completed, display immediate results; thus, providing the learners with the correct answer for every question. Such instant results help learners to view their errors in real time and helps them remember the right answer for a longer duration. Self-assessments help learners judge their own understanding of a topic or chapter and plan their lessons and learning strategies accordingly. With a digital publishing platform, publishers can create eLearning modules as well as mLearning modules. In either case, students have the freedom to learn at their own pace. There’s no longer a race to stay ahead of the rest of the class. Each student can go ahead with his/her course according to their own learning capabilities. Moreover, with interactive features, they can change the font styles and screen brightness, customizing the eReader according to their preference. Also, the learners can go through the courses and undertake online assessments multiple times. This allows for flexible and effective learning, and students can retain the information better. Cloud storage is the norm today. Cloud technology stores information in one central location, making it easy to collaborate, view and edit content. If publishers want to update the content, instead of reprinting the textbooks, they can make changes on the cloud, which will be reflected on all the learners’ eBooks. By making changes to one file, you can ensure that all students have up-to-date content in their respective eBooks. Unlike the traditional publishing method, where reprinting is the only option in case of new updates, going digital saves time and cost. Replacing print with digital medium is undoubtedly cost saving as we saw in the previous point. Education publishers have to print out thousands of copies each academic year. By opting for a digital publishing platform, they can limit the publication to one copy and distribute it to thousands of learners online. The reason why eBooks are cheaper than regular printed textbooks is because it does away with a lot of additional processes such as transportation, packaging, shipping, etc. Digital publishing requires just a software and computer device. By leveraging a digital publishing platform, educational publishers can do away with printing, reprinting and distribution costs, eliminating unnecessary expenses and increasing their revenue. Digital publishing made data collection possible. This data is used by publishers to track the sales of their eBooks, decide the pricing and distribution & sales strategies. They can get detailed insights on their eBook’s performance, such as the number of people who downloaded the eBook, impressions made, etc. Educational institutes can also use this data to get an insight on the consumption patterns of the learners. Based on the content consumption patterns and engagement levels of the readers, institutes can customize the content. Analytics tool is an important feature that a digital publishing platform offers. It helps the institute and publisher to view the eBook’s performance and the learners’ engagement with the courseware. Going the digital way also saves your expenses on unsold books. When publishers publish printed books for stores, there’s an unpredictability factor. If the entire stock of book is not sold, it leads to some amount of losses. With digital publishing, there’s no need of printing and stocking physical books, therefore, there’s no loss incurred from unsold books. With new and advanced tools, creating and publishing eBooks has become easier than ever. Increase in digital publishing has given rise to numerous publishing software. With just the click of a few buttons, publishers can create an interactive digital eBook. These software tools allow one to create an eBook that is complete with multimedia, social features, assessments, and interactivities. Publishers can either undertake the task themselves or assign a company to create an eBook. Publishing and distribution of content have also been made easy with digital publishing. The eBooks can be DRM protected to prevent unauthorized use and can be distributed safely for mass consumption. The use of technology is at an all-time high, not just in brick and mortar institutes, but also on online platforms. Students can now enroll for multiple courses and easily manage their studies with flexible online learning options. Novels, magazines, cookbooks, textbooks, newspapers, every kind of reading material has moved on from print to digital platforms. 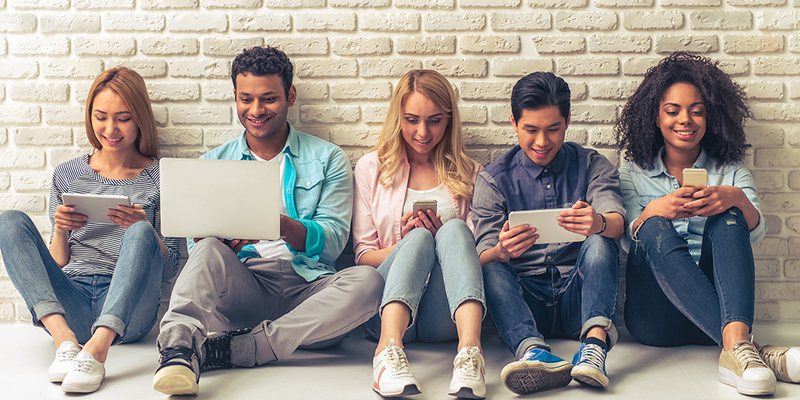 With millennials forming a major part of the learning demographic, it is essential to use a tool that connects with them. And digital publishing helps create that tool in the form of eBooks. A digital publishing platform enables publishers and education institutes to create and deliver compelling learning material which will enhance their overall learning experience.